Maurice FitzGerald, 9th Earl of Desmond (died 1520) was the brother of James FitzGerald, 8th Earl of Desmond. Upon the murder of James FitzThomas FitzGerald, the 8th Earl of Desmond, in 1487, his brother Maurice became the 9th Earl of Desmond. The murderer, John Murtagh was apprehended and put to death. In 1489 a plague ravaged the country, followed by a famine in 1497, and many died. About the year 1500, Maurice FitzGerald rebuilt Desmond Castle, a three-story tower house in the town of Kinsale, to serve as a Customs House for wine and gun powder. "The condition of the inhabitants within the Pale at this period is thus described by a contemporary writer: 'What with the extortion of coyne and lyverye dayly, and wyth the wrongful exaction of osteing money, and of carryage and cartage dayly, and what with the Kinge's great subsydye yerely, and with the said trybute, and blak-rent to the Kinge's Iryshe enymyes, and other infynyt extortions, and dayly exactions, all the Englyshe folke of the countys of Dublyn, Kyldare, Meathe, and Uryell ben more oppressyd with than any other folke of this land, Englyshe or Iryshe, and of worsse condition be they athysside than in the marcheis.' 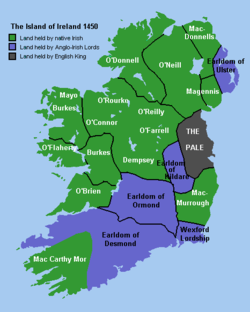 O'Daly thus writes of Earl Maurice: 'This man was subsequently far famed for his martial exploits. He augmented his power and possessions — for all his sympathies were English — and a furious scourge was he to the Irish, who never ceased to rebel against the crown of England. The bitterest enemy of the Geraldines he made his prisoner, to wit, MacCarthy Mor, Lord of Muskerry; and now having passed thirty years opulent, powerful, and dreaded, he died  to the sorrow of his friends and the exultation of his enemies.' He was buried at Tralee. His first wife was daughter of Lord Fermoy; his second, daughter of the White Knight." The cannons of Reginald's Tower helped repel the forces of Perkin Warbeck and Maurice FitzGerald from Waterford in 1495. Maurice's second wife was Honora, daughter of the White Knight. ^ a b Webb, Alfred. A Compendium of Irish Biography. Dublin: 1878.